HomeUse of common parts stair for installation of washing equipment, flat in Chelsea. Make access to washing machine and dryer in the bedroom, surrendering wardrobe space which backed onto the stair cupboard. This would avoid any problems of getting current building control approval for the alterations and also avoid any difficulties with the forthcoming fire risk assessment under the regulatory reform fire safety order 2005 for the common parts. Provided there was 30/60 minutes fire resistance between your bedroom and the stairway this should be acceptable. It might mean that the plumbing arrangements are minimally altered to the ones already installed for the washing machine. It would give complete flexibility in choice of washing machine and tumble dryer and need not look out of place if doors were fabricated an identical style to wardrobe door to cover the recess as the doors you already have. This would be the minimum cost and without any doubt at all a solution to which no one could object, and one would still be using the footprint of the cupboard without wasting space. Option 2. 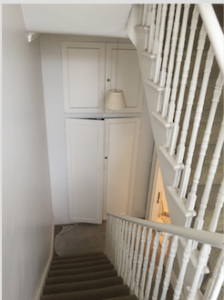 Within the existing cupboard install a washing machine with top loading door so that machine door cannot prevent a fire shutter from descending its full height in the event of al fire within the cupboard being detected. This would probably prevent the installation of a tumble dryer due to height restrictions. The fire shutter would need a 30 minutes fire resistance and smoke sealing such as the Coopers ‘Firemaster for lifts’ shutter. This would need detection using a smoke detector within the cupboard, battery backup power supply, and the usual green press button to enable the shutter to be raised after it had lowered itself on detection. This shutter is made of impregnated fabric and there is a question as to whether the machines will be safe from tampering in the common parts. The shutter would need regular maintenance and might not be acceptable to some building control officers who will not accept them because of the maintenance uncertainty. An alarm sounder would be needed in the flat to indicate that the shutter had inadvertently been left in the open position, and/or a flashing strobe light in the kitchen would do this, but it would need to be hardwired to the fire shutter and would add cost. I came to the opinion that option one was the best option and was the only option I could support. Options 2 and 3 can be criticised on grounds of complexity with more things to go wrong, eg, batteries to be maintained, motor reliability, detector replacement and so on. These ‘fire engineered’ solutions can be easily criticised by building control and by a fire risk assessor for the common parts. These two options certainly employ a bit of fire safety hardware but bearing in mind that the proposed use of this cupboard flies plainly in the face of the regulation guidance that states that ‘space within a protected stairway should not be used for anything except electricity meters’ and even then the meters should be enclosed within a secure cupboard separated from the escape route with fire resisting construction – see the governments approved document B2 Clauses 2.30 and the 2.40 available on the web.